A crowned heart clasped between two hands that symbolises love, friendship and loyalty; the design of the Claddagh ring of Ireland is one with a long and mysterious history full of romantic tall tales. But who can truly claim responsibility for the original motif? A large portion of my family heritage is Irish, so when I had the chance, I took the first opportunity that came my way to visit the Emerald Isle. I quickly became very fond of my ancestral land, particularly the serene countryside and quaint townships. At the time, I considered buying myself some souvenir jewellery in the form of a Claddagh ring, but with finances not permitting (read: cash-strapped university student), I decided to look forward to a nice boy buying me one in the future. I did, however, further research the meaning and history of the design that claimed my interest. The town of Claddagh, which means “stony shore” in Gaelic, is an area just outside the old city walls of Galway, Ireland with a history that extends back prior to the arrival of Christianity in the region during the 400’s. The small fishing village became home to some rebellious Celts who settled there and stuck hard to maintaining their Catholic faith, Irish language and many of their own customs. Even throughout a period of foreign occupation in which the English speaking Anglo-Norman’s ruled the region and dominated Galway, just across the Corrib River, the Celts of Claddagh defiantly elected their own king on an annual basis and continued to rely on fishing as their sole livelihood. While a number of theories exist around the creation of the first Claddagh ring, the most widely accepted is the story of Richard Joyce. Joyce, a Galway local, was on a boat to the West Indies when it was intercepted by Algerian pirates in the 1670’s. Joyce was captured and sold into slavery under a Turkish goldsmith where he remained for 14 years, during which time he learnt his master’s craft. In 1689, King William III, ruler of Britain and its colonies, demanded the release of all British subjects enslaved in Algiers, including a jubilant Joyce. The tale goes that having grown fond of Joyce, the Turkish goldsmith offered him his only daughter in marriage, hoping it would induce Joyce to stay. Joyce, however, declined the offer, instead deciding to return to Ireland. It is said that upon his arrival home, he used his goldsmith skills to craft a ring for his sweetheart in Galway, who he later married. 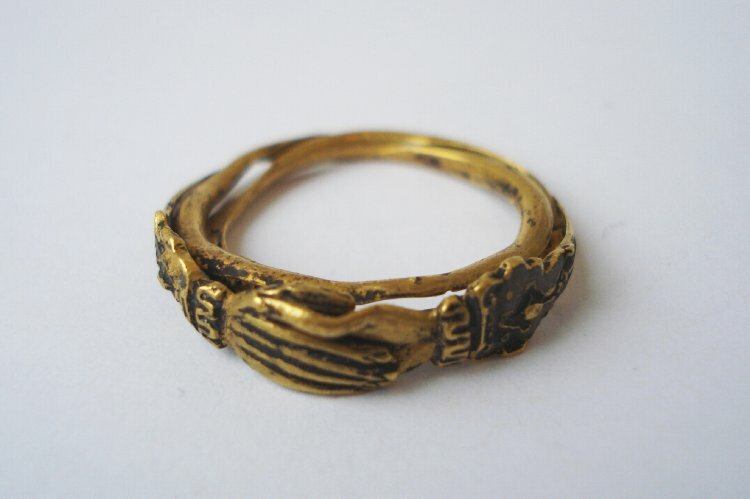 This ring was thought to have been the conception of the Claddagh design of Ireland. But did Joyce bring the idea back from his years as a slave? Or was it a design he adapted from the locals in Claddagh? Either way, his initials appear on one of the earliest Claddagh ring samples still in existence. Despite the potential for inaccuracy or romanticised re-telling of the Joyce story, there is almost certainly some Mediterranean influence in the motif’s original design. Joyce could have taken inspiration from similar Egyptian designs that he likely observed during his enslavement, or could have simply reinterpreted and manufactured it locally after being inspired by existing Celtic designs used by the people of Claddagh. If the latter is the case, the original design may have made its way to Galway from Spain alongside the trade of wine and other goods; or possibly derived from the Celts historic dealings with continental European civilisations. The Celts had much contact with other cultures through trade and migration over their history, particularly with the Greeks and Italians – which again leads us back to the possible Mediterranean influence on the design. Claddagh rings are also classified under a family of rings known as “fede.” The Italian “mani in fede,” meaning “hands in faith” was a motif of clasped hands incorporated in rings used since the Roman Empire to seal the pledge of vows, such as in wedding ceremonies. Could this be the inspiration for the ring? There are many questions over the name and credit of the ring’s design, and to the geographical relevance to the town of Claddagh. If the design did indeed come from its namesake town and was of Celtic origins, the decorative style was almost certainly influenced by foreign cultures in some way. Although similar rings have been produced in Galway since approximately 1700 (following Joyce’s original version), the name “Claddagh Ring” was not coined until the 1840’s. This came about in a publication suggesting that the rings originated as heirloom wedding bands that were handed down by the women of Claddagh. This actual practice is thought to be inaccurate on a number of counts, nevertheless, the ring’s design is still known by this name today. 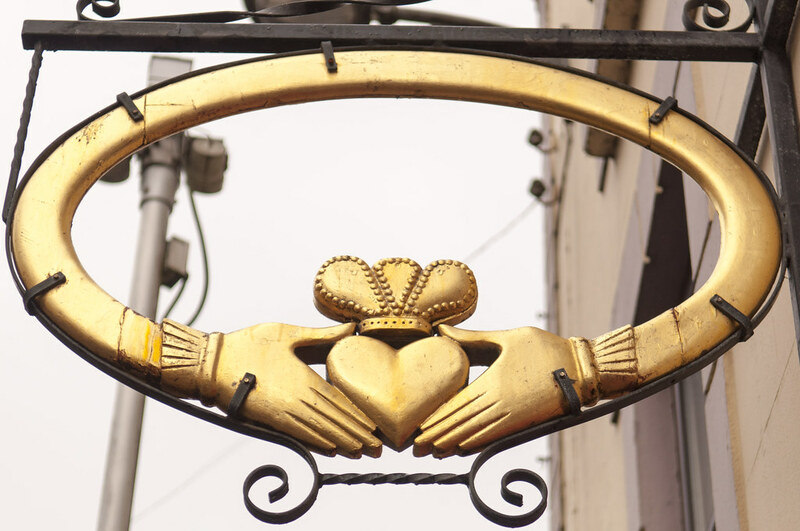 By 1900, the Claddagh motif was being produced on a commercial scale as rings and other forms of jewellery such as brooches, bangles and scarf pins. Today, it still holds a place in Celtic tradition, particularly for weddings in Ireland and beyond. The mystery of the Claddagh ring’s true origins will likely never be solved, although I am certain the romance and tradition will live on through the eternal values of love, friendship and loyalty. In the words of an Irish wish associated with the Claddagh, let love and friendship reign. For more Irish symbolism, design and culture, see Untying the Meaning of Celtic Knots.